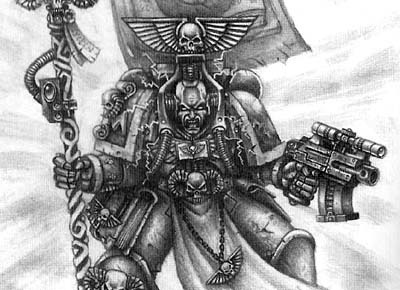 There is no other piece of equipment that sets a Librarian apart from every other marine on the battlefield than his psychic hood. 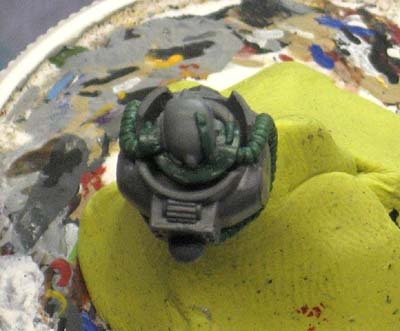 It's instantly recognizable and known by Xenos and Marine players alike. When it came to build the psychic hood for this guy, I had a few things in mind that I wanted to do. As a side note, I wasn't attempting to copy the image (psychic hood) above, I just added that because he looks cool. I wanted the cables to be pronounced and bracket his chest plate. Knowing the shape of the chest I was going to be using, I figured I could make them look like they were flexible and fit between his collar plates like they were designed to do just that. The actual part that wraps around his head needed to be low profile. The armour already had a high collar and I didn't want the elements competing with each other. The addition of a few extra wires and cables added to the illusion and make it look more like it belongs there and isn't just parked there because there's no other place for it. 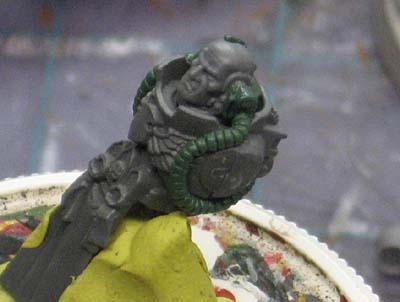 I choose this specific head because I knew I could build off of it with the hood. Using it as the base, I added to the sides and the back of it to further make it look like it came on the model and wasn't added later. All in all, this is just one part of the model. Sure it's important and getting the detail in there is critical, but having all the other pieces in place also help with the overall illusion. Put it all together and you've got a very convincing model in the end. ... I realy need to do a step by step on how I build these. UPDATE: Here's a step by step using a shoulderpad as the main component. i was wondering how you did the cables?? it looks great ! Really liking the cables also, great work. This has properly been asked already but are you painting this piece also? I am really liking this ron cheers! Thanks guys, unfortunately, this is only a "build" for me. 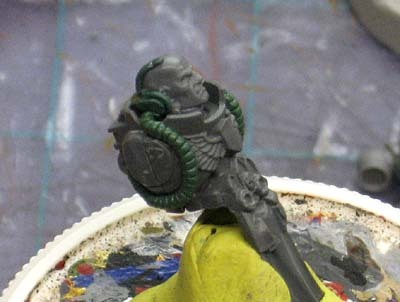 I won't be painting him or the Chaplain. I can't believe that you have the time (or the skill) to consistently churn out such spectacular models--all while maintaining this site. Ron, for the tubes which way did you do them? Or did you use many small balls of GS depressed slightly into round edged discs and places one after another onto the mini (the more time consuming method)? Its looking good so far though. This is one of my favorite Librarian conversions so far becasue he just looks the part and fits perfectly. Da Sub: It's a thin sausage of GS that has the ribbing cut into it once it's in place on the model. That's the best way I knnow to make sure the tubing has the same thickness and consistency down the model. Ron: You should add a link to the other hood you did a while back. I think it was on a Termie right? Reece: I thought about doing that when I first posted this... I knew I should have added it. Yet more good work. When will you stop? GDMNW: Thanks, It's a constant challenge to try and improve. I just picked up some new brushes so that's helped my painting tremendously recently.